The ball is round. The place is Philly. 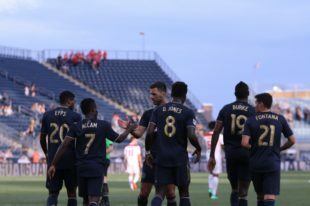 On Tuesday, June 6, I convinced my mother to take me to the fourth round game of the Lamar Hunt US Open Cup of the Philadelphia Union versus the Richmond Kickers, a low ranking team in the USL. Some people have asked me why I wanted to go. After all, the stadium was nearly empty. It made me think about why I wanted to be there and what it means to be a fan. Although the Richmond Kickers may not be the best team, I always like to see the Union play, whether it is the MLS finals or a training session. These extra games can be exciting, and there can be upsets such as what happened when the New England Revolution played against Louisville F.C. You can’t take anything for granted in soccer. These games can go to penalty shots, which is what happened when Columbus Crew played the Chicago Fire Those penalty shots stayed even all the way to the keepers’ shots. Or they can be one-sided. There can also be plenty of goals scored, as occurred on Tuesday. In case you missed it, the Union scored five goals, with four in the first half. I never get tired of dooping. The other reason I like going to these games is you get to see some of the young players try to impress the coaches and the fans. Watching Anthony Fontana, Derrick Jones, and Michee Ngalina play was great. I was especially excited to cheer Michee on, since I have never seen him play before, and he is only 18 years old. It was nice seeing these players on the field with more experienced players like Ilsinho, Haris Medunjanin and David Accam (who scored his first goal at Talen Energy Stadium for the Union off a penalty shot). There can be special, unexpected moments at these games. My favorite vendors, the Cow and the Curd, Chickie-and-Pete’s and P.J. Whelihan’s, were open (surprisingly) and they still had some outside games open in Toyota Plaza. I was impressed by the 10 or so really dedicated Richmond Kicker fans, dressed in red, who made the trip up. It was really funny when the Sons of Ben noticed that these Richmond fans were moving their seats up and chanted: “Hey Richmond, those aren’t your seats.” I found myself singing along with the Sons of Ben. (By the way, the Sons of Ben always show up). I even found myself sitting in front of the Hometown Hero and his family. Going to these extra, non-MLS games makes me feel like a true fan. I often see comments from people who say that the Union are terrible and that they will not watch or go to the games in protest. Although it is okay to criticize your team (I do that frequently, often very loudly, at the games), I have never felt that the Boys in Blue did not try their best to win. We all know that players tend to play better when their families are in town (such as with Ilsinho). Sure, I am a happier fan when my team is doing well. When they win it is so exciting. But, it goes both ways. Teams do better when there is a crowd behind them cheering them on. Those days and nights are full of energy. But those different types of nights – when the stadium is almost empty and the game is not important to their standing – can still be cool. If and when the Philadelphia Union turn it around, I am proud that I was one of the few that bothered to show on a random Tuesday night when I had school the next day. Author: Benjamin Brecher Benjamin Brecher is a middle schooler who loves all things soccer. When not supporting his home team, The Philadelphia Union, he can be found playing on his travel soccer team, watching Premier and La Liga games, or collecting soccer cards. Fine piece of writing, Benjamin. An honest and well-considered point of view. I’m more interested in open cup matches for this club at the moment, but real life circumstances have conspired to keep me away. Here’s hoping the Union again topple the Red Bull from the tournament. Nice job Benjamin. We love going to the Open Cup games for many of the reasons you mention. A chance to see teams we don’t see in the regular season. A chance to see Union players that may be stuck down the depth chart. Bohemian Rhapsody! Anything can happen in these games. Who can forget the final against Seattle. Even though the stadium was not quite full, that was probably the most electric atmosphere at Talen we have ever experienced. For those Open Cup haters out there (yes, you know who you are) the Cup does mean something. A CONCACAF Champions League slot is on the line. +1. Exactly how I would have responded. Than you. I totally agree. Very nicely done. I enjoyed reading. This is great! I love the Open cup games because of the smaller crowds, the Union playing the younger guys, and something wacky always seems to happen – dust storms!, fat guys dancing without shirts on, Bohemian Rhapsody, it’s random and fun. Keep writing, love the articles. Early round Open Cup games are the best. The atmosphere is the most fun. I’m very disappointed that I’m going to miss Saturday’s game since I’m in Boise, ID visiting friends. I wanted to be at the Match but I was out of town on Business. The Open Cup is always exciting to watch. Enjoyed the article. Not what I expected from the title… so, well done. I too enjoy going to the Open Cup games and was there vs Richmond. Unfortunately I can’t make it this weekend, and of course if they win, I’m sure the next one will be on the road… so I’ll prolly have to wait a while to see another one. Regardless, it’s always fun to go to the stadium. It’s one of the reasons I renew every year, despite the fact that the Union are usually a mess. One again Ben you’ve written a good one. It’s nice to be reminded not to be so jaded. Thanks for the younger perspective. Great piece Benjamin. Keep supporting your team the way you choose to and keep writing soccer. You could have a future in it! I love going to Open Cup games. It feels like they are playing just for you and you have the whole stadium to yourself! I like the fact that they are letting the seats be General Admission for Saturday and not worrying about seat numbers. It helps people get a chance to sit in locations they wouldn’t normally sit in and see the field and game from a new perspective. I wasn’t there but your article made me feel as though I was there. Support The Philly Soccer Page on Patreon! Jim Curtin speaks to the media following the Union's 3-0 win over Montreal. Designed by WPZOOM Copyright © 2019 — The Philly Soccer Page. All Rights Reserved.